As many of you may know, I was given the honor of being named this year, along with 3 others (Chris Craft, Lisa Sjogren, Adam Bellow), an ISTE Emerging Leader. My new colleague, Julie LaChance was awarded ISTE’s Outstanding Young Educator Award. I was excited to meet the awardees as it was certain that we had something in common and that these were people with whom I should be collaborating. It turned out that many of us ran in the same circles and that we indeed share a lot of the same goals and motivations. Before reaching Denver, I had spent a few days with some colleagues vacationing in the calm before the ISTE storm. As the ‘baby’ of the group, I found that my outlook, goals and passions did not differ from my elders. One interesting fact I learned was that it seems that ISTE’s smallest membership is with educators under 35. A colleague made the observation that perhaps ISTE is irrelevant for younger teachers, who find it commonplace for technology to be integrated into teaching and learning. I know for a fact that while younger teachers are accustomed to using technology and that there are more technology integration courses being taught, it should not be expected that young teachers are experts in technology integration, receive support in their schools for successful integration or are aware of how technology can transform their teaching. They also may not be aware of trends, policies and projects that are occurring around technology in education. In addition, ISTE provides a venue for young teachers to meet more veteran teachers who have been successfully integrating technology for years. That said, there was definitely a small number of attendees at the Young Educators’ Network event. I have two theories as to why this is. For one, perhaps we don’t want to be labeled. Being a newish, younger teacher can often hold a stigma. Younger teachers are seen as novices, even if we don’t feel like one. Secondly, yes, we’re young, but one aspect of being a teacher is that your colleagues are of various ages. As such, we’re used to hanging with colleagues who are of a different age or generation. I still think that ISTE is relevant for young educators, and I feel that building a network of young educators is important. The 4 other award winners are people for whom I have a lot of respect. They are accomplished and make a huge impact in the field. Were it not for the Young Educator’s Network, I would not have connected with them. In addition, as the youngest members of the organization, we hold the future of it in our hands. We hold the future of education and technology integration in our hands. It is up to us to build the future that we want and to ensure that the best practices that we know and share continue while also fostering innovation and global collaboration. The Young Educator’s Network creates a community for us to connect and collaborate. I do find, however, that even within the Young Educator’s community there is a range of experiences and associations. It was easy for us award winners to connect since we were already connected through Twitter or common colleagues. This makes me start to take the title of Emerging Leader more seriously–even if it is a label tacked on by ISTE. I do suddenly feel charged with the duty of moving best practices in technology integration and global collaboration forward. ISTE has provided a network that Twitter, the blogosphere and Ning communities can’t always build since not all educators my age are as entrenched in these online communities as I am. So for those young educators out there, let’s take the bull by the horns and stay connected. It is up to us to decide what the future will hold for our students and our profession. 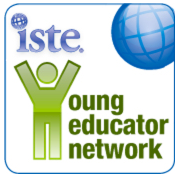 Please stop by Julie’s blog about Young Educators at ISTE here. You can also join the Young Educators Network here. As a young educator, I'm interested in staying connected, but I'm less interested in doing that within the constraints of traditional hierarchical organizations. I'm not against institutions in principle, but I think an organizational conference, especially the size of ISTE risks pricing out younger educators and overwhelming them with the sheer number of attendees. Hey, Mary Beth! Congratulations on your recognition at ISTE2010. Well deserved, no doubt about that! It was a pleasure to meet up with you last year at NECC09 and Educon 2.2 and to keep in touch throughout the year. Looking forward to meeting up again in the coming year. I wonder if the "age" demographics at ISTE events correlate with and reflect the "role" demographics? I gather that a significant percentage of ISTE attendees are in support roles (tech teachers, tech directors, administrators, vendors, etc.) as opposed to classroom teachers, and there are likely to be more experienced educators ("experienced" is my euphemism for older) in support roles, given the natural order of things. Add in the financial component, and I would think that younger teachers are at a bit of a disadvantage in attending a(n) (inter)national conference such as ISTE. That being said, I wonder whether we will see a change in conferences such as ISTE in the coming years? With the increasingly pervasive use of communications technology and social media, not only will more educators be drawn to events like ISTE2010, but also will such events be available to more folks without all of the travel. Granted, I'd never completely replace F2F with online-only, but there's a lot of value to be had via the streamed/recorded events. Great point that ISTE prices out young educators. It can also be overwhelming. To me, this is all the more reason why ISTE needs to stay relevant to young educators. It is the only organization of its kind that I know of, and it's local affiliates are vital to maintaining technology initiatives at the local level. Perhaps ISTE needs to get more input from young educators to hear what they want or why they might shy away from joining such a large and hierarchical organization. Perhaps the initiative needs to start with the smaller, local affiliates! Perhaps if schools know that their younger educators are being recognized by the institution then maybe they'll be more inclined to send them. Maybe. I also agree that streaming will help expose more and more educators to what goes on at ISTE without the cost, but I also agree that nothing compares to the f2f informal conversations that occur in between sessions or at late night Tweet Ups. I, too am glad that we've stayed connected! Great post. I heard about ISTE through Twitter, but had no idea there was a young educators group. I didn't go to the event because I had no idea it existed. I agree that we cannot assume that young teachers are masters of tech and tech integration. I have a group of Math teachers in their mid 20's that do not use tech in their classroom. I spent part of last year helping them set up a Google Reader account for a Grad class they were in. After meeting many of the YEs, I agree that there was so much in common, but I also learned so much from the veteran teachers there. There does need to be an effort on our part to reach out to all Young Educators because we are the future. It is still a weird position for me to take on as a tech leader at my school. I'm only 31, but I realized that if I didn't step up for tech, who would? There is a fine line between being pushy with tech and educating other teachers. It's a line I will have to straddle in the next year as I try to get more teachers on board. I think if we all work hard as Young Educators, I think we can set the tone for the next decade on how we thing education should look in this country. Keep fighting the good might MB and now there are others out there who are fighting with you. There is definitely a stigma at times for new(er) teachers. I have worked hard these last few years so that I wasn't looked at as the "new teacher". I'm a new technology coach and that was even difficult for some to swallow, being so "new". There is something to be said about the "age" and "role" of these teachers too (as brought up before). A lot of newer teachers have not had the opportunity to be in a position of leadership that may "merit" the trip to ISTE or other conferences. The classroom teacher in the end is the one who will be using these tools for student growth and learning. In my case, I am in a small district, small budget, and sometimes small mind-sets. The global view of learning (w/ or w/o tech) hasn't quite made it to our town. I hope to facilitate that change, starting with this next school year. That said, the district often doesn't have the funds to send us to these conferences. And being a young teacher, I have a young family, and like in the district, money is scarce at times for these kinds of things. I am hoping to find some grants to help support my continuing PD and PLN. I'm dying to meet a lot of you f2f this coming year at Educon and ISTE2011 (keep your fingers crossed). But again, the PLN thing is huge. Its the way to stay connected when travel isn't an option. Twitter has been huge in my growth and learning. Thanks for the post. Great insights Mary Beth! Still something of an outsider myself I observed that there does seem to be a generational gap among those attending the conference as well as here locally in the teaching community I know mostly from contact through school and other social events. Just the other day I had to explain to a teacher what ISTE actually was, and I'm pretty sure this teacher was under 35. I like the idea of your Young Educators not only promoting new ISTE awareness among those under 35 but also integrating, assisting and sharing with those teachers over 35 who bring their own lessons-learned and other wisdom to offer. As a SIGVE ISTE member I suppose I have to mention again how collaboration and serendipity help foster these collaborations on ISTE Island in Second Life where, incidentally, educators from all ages gather to help each other informally as well as in person. This years ISTE virtual component was a good start at what is to come. Personally I would like to see the virtual component stepped up quite a bit to ensure financial barriers to not prevent educators of any age from participating. Such a model has saved IBM $350,000 for their Academy of Technology (formerly a RL conference). I suppose the question of relevance depends on what ISTE and the YEN *do* between now and next year. If they don't spend any time encouraging dialogue between young educators, then they may well not exist. If ISTE serves as nothing more than a conference organizer, they are inherently only as relevant as we believe them to be. For me, the YEN and ISTE serve as vehicles for meeting really smart people. What are the odds that you would have spoken to me at EBC if it weren't for the award we shared? I suppose anything is possible, but that gave you an impetus. Now we're connected. I hope the focus for ISTE becomes what happens the rest of the year, not just during one week in the summer. When I read your post, I was thinking along the same lines as Andrew's comments. Because I no longer work in the Tech or PD department, my district did not send me to ISTE. I had to pay my own way. The people my district sent this year were only from the Tech department. Most districts see ISTE as a "tech" conference only. In fact, weren't we discussing (prior to the conference) that ISTE is more an education conference than Tech? Perhaps ISTE needs to market itself a little differently as well? An interesting post, Mary Beth. As a representative of the older educators in the crowd, I would say (and this me just be me) that my respect for the participants of ISTE has very little to do with age. There are certainly differences. As someone who started teaching before desktop computers, and someone who has been involved in educational technology since Radio Shack Model 1s (look it up), I carry a perspective that comes from having witnessed an evolution in the field within the context of education. Younger educators, even beginning educators have another perspective that I find to be just as valuable, a generation who has grown up using information and communication technologies, and using them as a way to accomplish your goals. Again this is a perspective that I lack but find to be valuable today and extremely interesting. I can certainly understand a sense of stigma that younger teachers might feel in their schools. But I think it would be much less so at an ed tech conference. Ack. The rest of my comment disappeared… Hmm. I also noted something about Teacher Ed programs that spend entirely too much time on theory and content, and not enough time on teaching/learning strategies. In my previous job, I helped teach new teachers hired in our district. Many of them came into teaching knowing how to use the "tools," but only at a technical level. They had no idea how to help transform student learning with tools. That definitely needs to be addressed. My final comment- I'm glad you're an Emerging Leader… even if they only gave you about 10 seconds of screen/stage time. With people like you, our younger generations of teachers have a valuable resource… now we just have to get them networked with you! Thanks for all you do, MB! This is an interesting post and I found the comments interesting as well. When I think of young educators, I don't often think of age, I think of experience. ISTE defines Young Educators to be those under 35. I wonder why they chose that age? If the number was 30, would they have even a smaller number of people involved? Regardless of the age, it's important that educators with a wide range of experiences continue to learn and share with each other. While veteran educators, like David, bring pretty amazing thoughts to the discussion, younger educators, like you MaryBeth, bring another perspective as well. Both are extremely valuable. While you may have felt that there weren't that many young educators at ISTE, I actually felt as though there were more than the previous two years I've attended. Maybe that's not true, but I felt as though I saw a lot more young faces. Keep in mind that if your district isn't paying for the conference, it's rather difficult for newer teachers to attend. Many aren't making that much money and often have student loans or other bills to pay. Spending over $1000 to attend ISTE just may not be feasible. I love how you say 'only 31.' Why does age matter when we're motivated and want to make a difference? I do agree that we can't be pushy and I would also add that sometimes when we are young trying to guide older teachers, we may be looked at as part of a different generation that is more comfortable with technology. I think that it's important that we stay connected and tuned into what each other is doing. Hopefully in Philly next year I can help promote such networking events a little. Good point about ISTE Island. While I myself have only visited a few times, I know that it is a great way to get connected when you can't physically attend ISTE or if you want to tap into what's going on. My worries are that virtual worlds and attendance is great for those who are capable of accessing them either through knowledge or basic access to hardware and Internet. That is why, to me, ISTE's f2f conference still holds value. I also agree that the dialogue between age groups is vital as we all have our own knowledge and ideas to share. By the way, that figure is staggering! It definitely connotes the power of virtual learning! Us meeting at EBC was exactly the kind of purpose I see in the f2f meeting of young educators. While I value all the people that I met at EBC and ISTE, there's something about knowing that you share a generational connection and future with a colleague that changes things. I agree, too, that if the YE Network is to be truly meaningful, there needs to be follow through, and not just when it's ISTE time again. I think it's important that we young educators remember and respect the contributions of those who came before us. One of the things I love about attending EBC and ISTE is the chance to engage educators for whom I have a lot of respect and who have been in 'the trenches' for a long time. I personally do not find my interactions with older educators any different that those I have with those my age or younger. If the passion is there, age does not matter. That is one reason why being a teacher is so exciting. Most of my teacher friends are at least 5-10 years older than I am! As far as the stigma at an ed tech conference, with a crowd as big as ISTE, your number of years teaching matters less than your ideas for sure. However, it may be intimidating! I think that money plays a huge part in who comes to ISTE. My trip this year cost me $1500 out of my pocket. I justified it by how transforming my experience at NECC was last year. (and of course, when I was notified of my award I was completely justified!) However, I don't have children and while I do have tons of student loans and a mortgage to pay, I was able to swing the trip. Perhaps ISTE needs to offer more free trips to ISTE. Only the winner received a free trip, us runners up didn't. I also completely agree that ISTE should market itself more as an education conference than a tech conference. Perhaps districts need to be more 'schooled' in what actually goes on in the sessions. Sadly, it is probably true that many districts send people just to check out the vendors in the exhibit hall! Thanks for the kind words-I'm so glad we got to meet! Your new "hat" will give you credibility with so many educators, both young and old. Hopefully your district will realize what a "gem" they have in their midst. As an emerging leader you have a voice that should make others sit up and notice. You have already used your voice to reach a very large audience and I'm sure your list of followers will continue to grow. Your energy and passion are inspiring to us all. I know you will take the bull by the horns and stay connected. School districts and ISTE definitely need to look at ways to get more classroom teahcers involved. My three previous trips to ISTE (formerly NECC) were covered by my district. Unfourtunately funds were not available this year, but I knew I was going to attend even if I had to pay my own way. Yes, $1,500 is a lot to ask from young educators who are already struggling to make ends meet. Wouldn't it be nice is each vendor saved some money from all their handouts and goodies and sponsored several teachers instead? I know vendors are there to "sell" their products and most classroom teachers have no say in how money from their district gets spent. But think of the PR that sponsoring some teachers would generate for their companies. I am glad I was able to get to know you on a personal level during our time at Estes. As a teacher who has 30 plus years on you, I am amazed at what you've already accomplished in your young life. Thanks for everything yo've already taught me and I look forward to the continuing conversation. Your right about "only 31". It's a mentality that I need to break as I move forward. I just convinced a young Math teacher to start blogging in her class with her students and I might have a young Science teacher on board as well. I still have some younger teachers that tease me a little about being involved in SM and education. I wonder if the Teacher Ed programs are a little to blame for this mentality. If the younger, tech friendly, generation is resistant to Social Media and Web 2.0, it is going to be tougher to work with older teachers that are not as tech friendly. IDK. I'm excited to start next year at school with some teachers that are willing to expand their use of tech in the classroom and I hope more YE will join the gang and make a difference. I'm glad I got to meet you and the other like minded people. I feel confident that we can all work together to make some positive changes in the edtech community despite the age groups. Good question, Mary Beth, and excellent commentary. I have spent a lot of time in schools and out, talking with educators of all ages. Just as it is a dangerous myth that students are digital natives who can figure out everything they need to know on their own, I have seen little evidence that most younger teachers have figured out how to incorporate technology into the curriculum. It's largely not taught in education school or master's programs, and it's not required, and many of the best tools, websites, etc. are fairly new anyway. The only way an educator – of any age – can keep up with best practices, best tools, best Web content, etc. for use in class is to actively engage with a carefully cultivated, knowledgeable PLN. And I've yet to see a conference better than ISTE for doing so. Great muse about the relevance of tech for younger teachers. I think that if more of us 'older' or 'seasoned' educators would take a few risks and learn about the infinite possibilities of technology, then we would truly all be more connected. What's even more important, I think, is for the seasoned educators to learn more about the ease of technology from the 'digital natives' and for the digital natives to learn more about the ease of educating from the seasoned educators. It's when both generations work together to figure out how to integrate it all into curriculum and the classroom that the real learning happens. Make sense?? Should we use age or should we be talking years of teaching? We have grad teachers of all age. Young teachers are those with 10 or less years of teaching. I came to NECC last year and it was the best and f2f meeting some of my twitter network was unforgettable. I am now in my 30th year of teaching, still loving it and sharing with new and exp teachers. Just was part of the slide2learn conf team. 2days iPods in Ed cost $75 per day including catering. NECC cost me $4000 as I came from Australia. Also many of the young in age teachers have young families. This would have made my trip impossible. I hate to admit it but the Young Educator Network needs to do more- not just a one time meet up at the conference- there is so much value in our collaboration. One thing, I was shocked to see during the SIG leadership meeting that the under 35 demographic was the smallest of all the other ages- except for the over 70 age group. I guess you, Julie, Chris, Adam, Andy and myself should have deliberate conversations about making the conference more then relevant but a valued professional development opportunity. I am writing a blog post about professional development, but I am a typically slower blogger so it probably won't be up until the end of the week. I have learned so much from each of the other ISTE Emerging Leaders and I am so grateful to be in the company of such brilliant minds. As a fellow "Emerging Leader", Young Educator Network member, and a newly appointed ISTE Membership Committee Member, I feel that this is certainly a valid and pointed question that resonates in me. I think many of the responses above raise valid points which were many of my initial reactions to the post. I think that there are a million and one reasons for us to say why people aren't involved in ISTE, or more specifically the YEN. I have found a lot of people use three main excuses (some of which are justifiable) as to why they don't attend ISTE. The one that makes sense to me is financial – The conference can cost a fair amount of money if you are paying your own way and have to travel. My solution for that is to ask your school or district-level supervisor to send you as a representative of your building or district. The worst they can say is "no". Explaining how your attendance at the conference sessions, meeting with fellow educators, and speaking with the vendors about the new educational technology solutions that will help further the schools mission to enhance teaching and learning will surely be worth the expense of the actual trip. Again, if they say "no" it is not a big deal. You then can either decide it is worth the money and go anyway (not a valid option for many – especially many young teachers) or seek grant funding from a local BOCES, or PTA, or other group that may have funding opportunities to send you to the conference. But that is the most valid of the reasons people don't "bother" going to ISTE (or any other large conference for that matter). The second is time. Time is limited, especially for young teachers. I often had people say, "You're going to a educational technology conference the first days off from school – that's crazy! I'm taking myself to the beach." I can understand being spent after a long school year – or at least I remember what it was like before I became a 12-month employee, but we are (or at least many of us say we are) life-long learners. I learn all the time – on weekends, after-school hours, and yes – even while on vacation. I think that ISTE, especially for young teachers can be a great way to start the summer. The days are filled with opportunities to learn about new things to put into place in your classroom or curriculum, and the nights can be spent hanging out and connecting with educators in a social environment that are implementing these technologies already or there at the conference for the same purpose as yourself. Time is not a real excuse for me because I think most educators would learn about tools or practices at ISTE that strengthen them as educators and in the case of learning new Webtools, actually save them time in the coming school year. The last excuse I hear (although I am sure there are many more) is one that actually does bother me. A lot of young educators that I know don't attend the conference because they think they know how to use technology. And they do – they use Facebook and Picasa or Google Docs – but using it as a consumer and knowing how to successfully implement it in an educational setting as a valuable learning tool are two different animals. Being tech-savvy is not enough – and I think it actually puts young educators in a bad position in the classroom. Having an iPad, iPhone, or knowing how to upload pictures to a Photostream does not excuse young teachers from the responsibility of using technology to its fullest. I have seen plenty of very seasoned educators who can run circles around young and new educators when it comes to the use of educational technology in the classroom. Having an iPhone doesn't mean that you know how to create meaningful podcasts with your students. And that is the point. We need to impress upon our fellow Young Educators (Many of whom I will assume are not reading this post) that their schooling did not end with a degree and that growing up or even keeping up with technology as a social trend is not a substitute for learning the successful integration and implementation of it in their craft. If you claim to be a life-long-learner… prove it! As for the YEN – I think that this group is up and coming. It was great to meet many of my fellow YEN members at the conference this past week and already we have been caught in a flurry of back-and-forth tweets and now blog-posts. The beautiful thing about our modern day ISTE is that it sets the stage and provides the grounding physical experience that is still essential for educational technologists. However, the learning and connections can grow and strengthen over the entire year on the web. I mentioned Twitter and Blogs (such as this one), but I hope when ISTE launches it's new site that the resources and collaborative and social nature of the site will lead to more people (of all ages) becoming involved and sharing their expertise in certain areas, as well as asking for guidance from those who have been there before or are going through similar situations as they are currently.